I read this article and found it very interesting, thought it might be something for you. The article is called Artsdesk: Our Kind and is located at https://www.totallydublin.ie/arts-culture/arts-culture-features/artsdesk-our-kind/. Alan Phelan’s Our Kind is a newly commissioned video piece for the Hugh Lane Gallery as part of their Easter Rising centenary celebrations. Positioned as a “contemporary response to Roger Casement’s trial and appeal”, Our Kind occurs on an alternate timeline wherein Casement has been acquitted of the treason charge which would have led to his execution in 1916. In Phelan’s speculative version of 1941, Casement is living in Norway alongside his former servant Eivind Adler Christensen. The film’s obscure narrative follows the arrival of the activist historian Alice Stopford Green – friend and supporter of Casement – whose presence causes an uncertain discomfort between the two men. During its 30 minute runtime, the purposefully stilted dialogue and varying photographic approaches of Our Kind lend a bizarre quality to the film which echoes the divisive and differing histories of Casement. Christensen was an ambiguous character, theorised by some to have been a British spy, or informant who forewarned British authorities of Casement’s plan to smuggle guns into Ireland. Although the nature of their relationship is a historiographically disputed topic, in Our Kind Casement and Christensen are depicted as lovers and co-habitants, living in an idyllic rural Norway amid snowy cliff faces and scenic lakes. 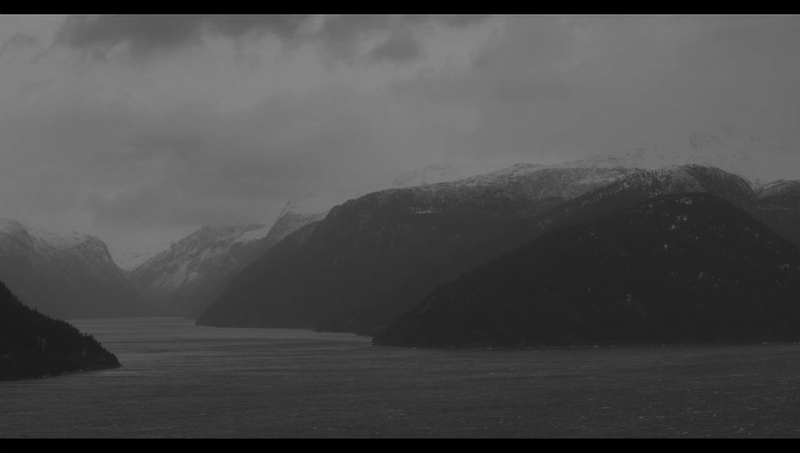 The film’s opening sequence shows Stopford Green’s journey to Casement’s home, her boat disturbing the tranquil water which spreads across the basin of the chasmic fjord that houses the exiled Casement. Stylistically, the film begins with references to the austere landscapes of Nordic noir television. A motif runs throughout this opening sequence of small huts and cabins being dwarfed by the surrounding wilderness. The rigid angles of the architecture jut out against the native surroundings, out of place and seemingly inhospitable. There is a theatricality in the actors’ performances which is magnified by front facing interior shots which recall stage design. The only scene which feels comfortable is an early scene where Christensen and Casement awake next to each other on the morning of Stopford Green’s arrival. “Alice will be here shortly,” says Casement. “We have to prepare.” Following her arrival, the dialogue becomes laboured and uncomfortable, as if each character is consumed by their requirement to repress their desires and perform some kind of ‘normalcy’. It is said that Casement’s trial in London was a show trial, held only to counter the sentiment that the 1916 leaders had been executed behind closed doors following trials lasting as briefly as ten minutes. In being tried publicly, Casement was given a platform from which to vocalise his concerns before ultimately becoming a martyr for the Irish cause. Phelan’s projected 1941 Casement was afforded no such platform, and as such there is a tangible sadness and sense of regret about him. Perhaps in Phelan’s 1941, the ‘black diaries’ – which chronicled Casement’s homosexuality – weren’t leaked, or maybe their distribution didn’t affect public opinion about him. The surreality of this fictionalised situation is heightened by the ever shifting cinematography which refuses to settle into one cohesive style. 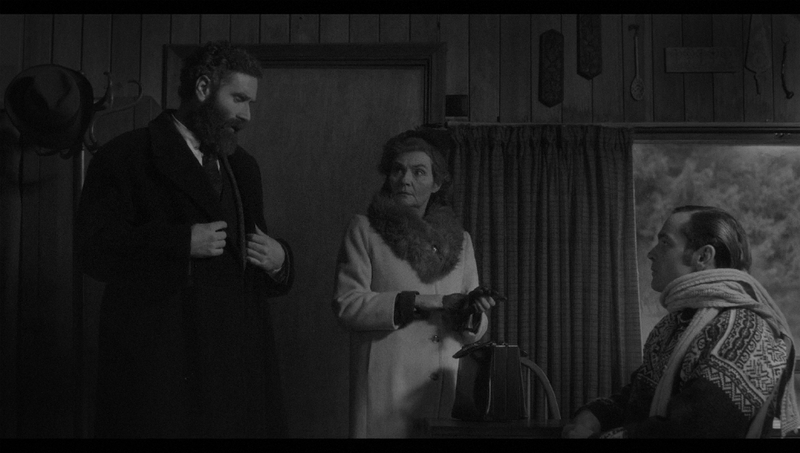 One scene depicts Christensen and Stopford Green coyly conversing under taut studio lighting like that of Hollywood’s golden era, while the next shot depicts Casement outside as he gazes into the ambient darkness of the forest. The skewed sensibility of the film’s dialogue and cinematography serve to highlight the wide ranging and disparate theories about Casement which have formed since his execution, most prominently regarding his ‘black diaries’. Phelan challenges the legacy of divisive histories around Casement by embracing the ambiguity of his character, portraying events that are estranged and uncertain. In Our Kind Casement is written as a complex human, rather than an assemblage of histories. Alan Phelan’s ‘Our Kind’ runs alongside the Roger Casement: High Treason exhibition in the Hugh Lane Gallery until Monday 2nd October. It is a part of their Artist as Witness exhibition series to commemorate the centenary of the 1916 Easter Rising.